George Demmy, CTO, TerraGo answered some questions for GISCafe Voice about the company’s recently announced TerraGo Workgroups, a subscription bundle that brings GeoPDF collaboration capabilities to smaller groups with flexible, cost-effective plans that meet their special requirements. TerraGo Workgroups bundles TerraGo Publisher, TerraGo Composer and TerraGo Toolbar products together so GeoPDF maps and imagery that can be easily updated and shared among all members of a workgroup or organization. 1) As the Workgroups are designed for smaller groups, are they adaptable to larger groups as well? Yes, definitely. TerraGo Workgroups are not just for small groups, but for a group/team/department/organization of any size that has a closed-loop workflow. A closed-loop workflow is when a there is a known set of users. A great example of a perfect fit for TerraGo Workgorups, would be a company that publishes GeoPDF maps for, say their field maintenance crews but don’t need to distribute those maps more widely. While anyone can look at the maps and documents – it’s PDF after all – only the people in the workgroup would be able to apply geospatial markups and send information to systems like ArcGIS. 2) What issues do groups have that initiated the development of the Workgroups? We’ve had a tremendous amount of inbound interest from people who feel that they could reach more users and get more out of their GIS with TerraGo software and GeoPDF, but our current licensing model which is based on targeting a universal set of TerraGo Toolbar users who can download and install at no cost to them, didn’t fit their budgets. By focusing on where the customer derives value, we’re able to bring their costs down in line with the value they derive from the workflow. For organizations like USGS, the universal model is a boon. They are providing little geospatial applications to anyone with Toolbar who downloads a US Topo. An Electric Membership Corporation with a few dozen powerline technicians don’t need to reach audiences of the same scope, so we made a subscription pricing model that reflects that. 3) Does this allow teams to then keep their maps secure and also publish out to the greater world? Yes, but secure is a loaded word. TerraGo is not in the document security business – we’re about bringing the power of place to workflows. We built GeoPDF on top of PDF, which has innate security features for encrypting content, requiring passwords, etc. So secure workflows can be built on GeoPDF. 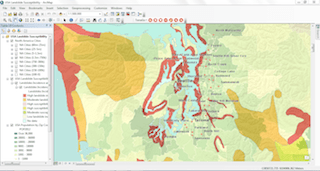 TerraGo Workgroups allows users to create and publish GeoPDF maps and imagery and share them with a group of people who will update and round-trip data back to HQ, but not just anyone with TerraGo Toolbar will be able to apply geospatial markups. Individuals outside of the workgroup will still be able to view and access the GeoPDF, they will just not be able update and round-trip as part of a TerraGo workflow. Think of it as sending out a “read-only” word document to people. However, if you are in the workgroup or share the workgroup ID, you will have full GeoPDF functionality and the ability to share and update information. 4) What ability do users outside the organization have to mark up, or interact with the Workgroups? From the perspective of a TerraGo workflow, individuals outside the workgroup can access and view the GeoPDF documents. However, you have to have a part of the known users to have the ability to update and round-trip information within the workflow. This entry was posted on Friday, May 16th, 2014 at 7:34 am. You can follow any responses to this entry through the RSS 2.0 feed. You can leave a response, or trackback from your own site.